When Dinting was forced to relocate and there was no room for RS8, it was moved to the National Stone Centre near Wirksworth in spring 1992, where they had plans of establishing a demonstration shunting area adjacent to the C&HP, now a long distance footpath. Unfortunately lack of facilities left the loco alone and exposed at the edge of the NSC car park, where vandalism took its toll. All the copper pipework disappeared, even the radiator core was crudely hacked out around three years ago. Although signs asked visitors not to climb on the loco, litter and stones got put down every aperture including engine breathers, gearbox, etc. She was in a sorry state indeed when Andrew Briddon came across her. Andrew Briddon grew up around locos in his father’s business, and bought his first loco, a 1960 0-4-0 diesel hydraulic, when he was 13. 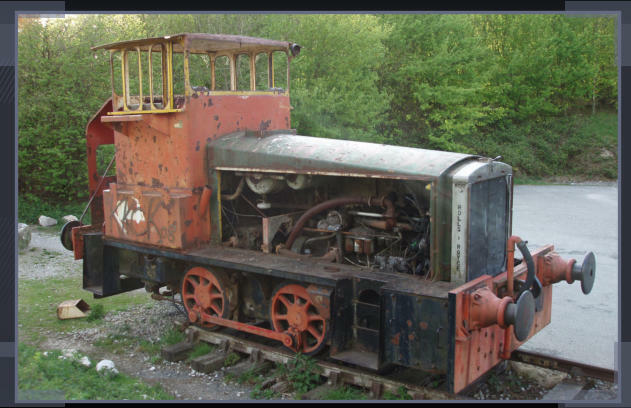 The collection has now grown to around 19-20 locomotives, all British-built industrial shunters, and including “Cheedale”, a Thomas Hill 0-4-0 of 1979, one of the generation of locomotives that had taken over the trains at Tunstead from RS8. In 2015 the Briddon family saw the state of RS8, and started to make enquiries. By the following Easter the Stone Centre had agreed to gift the loco to the Andrew Briddon Loco Collection, and it was collected in June. In 1972 RS8 was taken into preservation at Dinting Railway Centre near Glossop, Derbyshire.